Sculpture park “Legend” turns Penza into center of contemporary art. "Until recently the main tourist attraction of the Penza region was the Tarkhany museum, the birthplace of Mikhail Lermontov, the famous Russian writer. But today the sculpture park ‘Legend’ is another major attraction", - says Valentina Dusavitskaya, the curator of the gallery ART Penza at “Legend”, - Not long ago when I was giving a tour, some visitors admitted that they found out about us from their German friends. And this is not the first time Russians have learned about ‘Legend’ from foreigners”. We stand in front of an iron swing that reminds me of a curling piece of ribbon. At the bottom of this ribbon is a place where you can sit and swing. Two kids are swinging now, while their parents swim in the lake nearby. Every time the sculpture moves, the 40 bells ring – they’re hidden inside. This interactive piece of art was created by Italian sculptor Bettino Francini. And it’s only one of the 3,000 sculptures that surround us. Located about 600 km from Moscow, Penza has a population of more than 500,000, but is rarely mentioned in the Russian media. 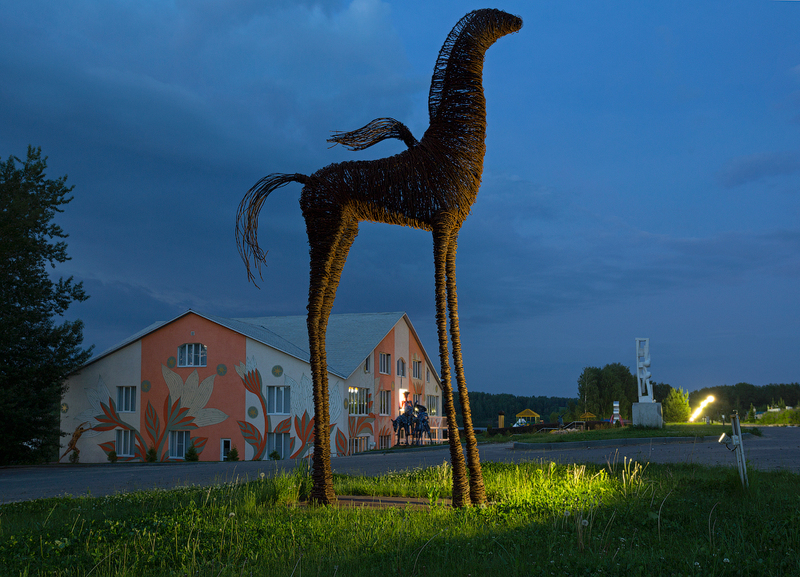 No wonder so few people know that one of the biggest open-air sculpture parks in Russia can be found just outside the city. “Legend” will celebrate its 10th anniversary this year. Over the past years artists from around the world came here to transform this rural landscape into a contemporary art center. 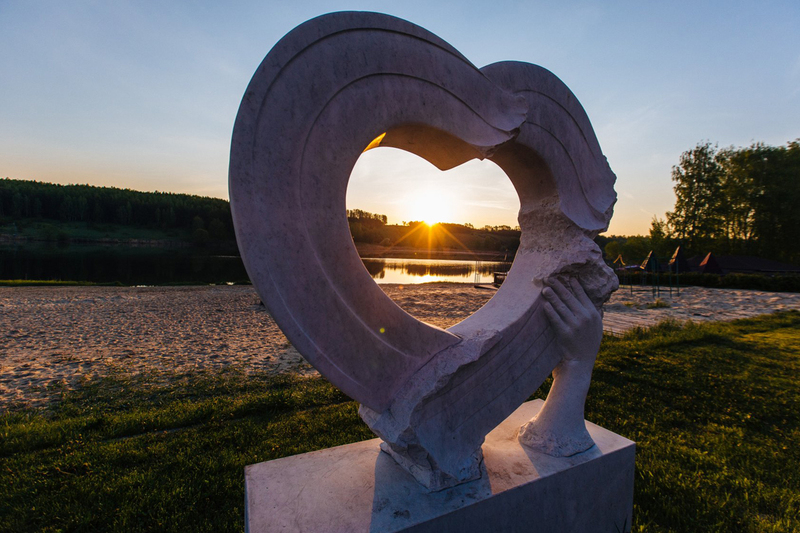 Today, the park, situated 20 km away from Penza, hosts sculptures made by artists from 69 countries. Animals, people, characters from fairytales, geometric shapes – all kinds of sculptures adorn the open fields. Although there are various styles represented, they match each other well: The bunch of iron giraffes make good company for the marble woman and the swinging stones. Pegasus fits in with the colourful abstract sculptures on the background. Your eye looks to the horizon, but still can’t see the limit of this park. I enter the park, and am struck by its size. You can easily spend two hours wandering between iron and marble creatures, both small and grandiose. 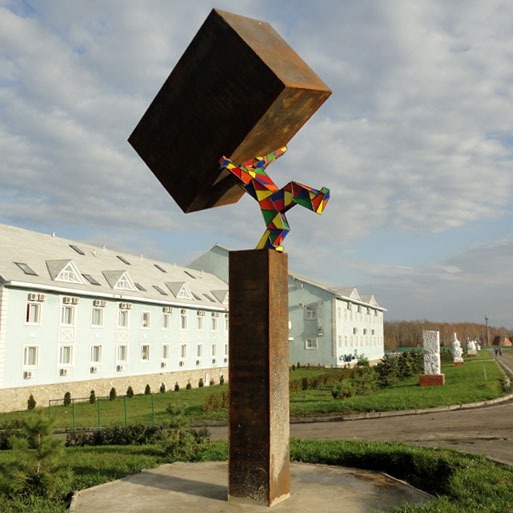 The idea to fill the area with works of artists from around the globe came from Yury Tkachenko, the director of “Legend”, sculptor and former Associate Professor at Penza State University of Architecture. Valentina and Yury give me a tour of the park. They point out a colourful iron sculpture in front of the hotel near a sandy beach. This work, which symbolizes a family, was made by well-known Japanese sculptor Satoru Takada at the very first symposium. Since then he has worked at “Legend” eight times. This year he plans to finish an ambitious project – one of the biggest Japanese gardens in the world. “I’ve worked in many countries over my 40-year career. But I want to establish an art exchange between Russia and Japan”, recalls Takada. 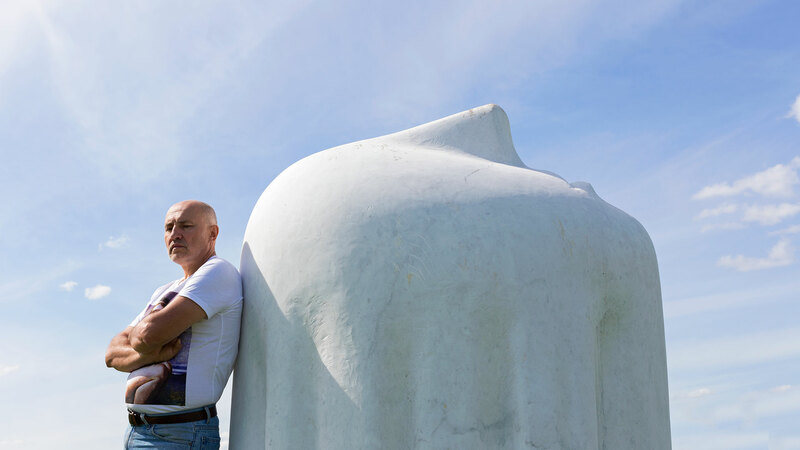 Nedim Hadziahmetovic, a Serbian sculptor who has created six monumental works for the open-air park and four iron pieces for the gallery, says that he spent about 9 months in Penza over the last 8 years. “I’ve also done about 30 paintings here when the inspiration struck me”, - he admits. “My works can be found in 14 different countries, like China, Gabon and even Iran. But what brings me to Penza is the advantages it offers, both professional and personal. The park provides excellent working conditions in a multicultural environment”. Visitors take selfies with a colorful man who can barely hold up a piece of iron three times his size. This work was made by Chinese sculptor Liu Yang, who has worked in 20 countries. “I’ve participated in 50 symposiums around the globe. My friends ask me why I keep coming back to this remote Russian town. Well, this place and the people here inspire me. I think that “Legend” has been shaping not only Russian art scene, but also global”. The 10th International Sculpture and Painting Symposium Penza 2017 will be held at 'Legend' from 17 April until 24 August in the hotel complex Art Penza.